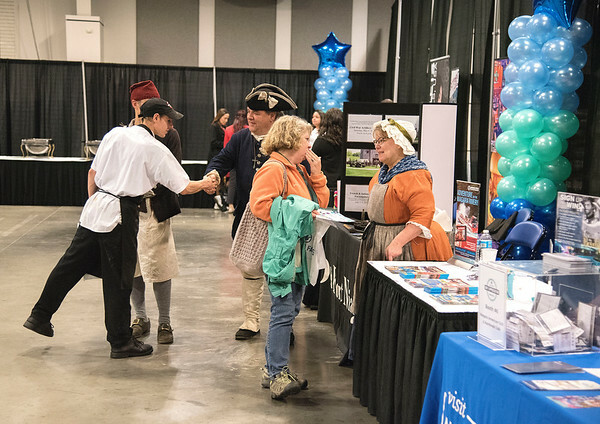 Youngstown, NY - TJI Fridays employee Joe Freedline greets Bob Emerson of Old Fort Niagara during Destination Niagara USA 3rd Annual Day of Appreciation at the Conference & Event Center Niagara Falls. What: Destination Niagara USA is hosting the 3rd Annual Day of Appreciation (flier attached). Who: All employees in the hospitality and tourism industry across Niagara County are invited to attend. Why: For the third year in a row, Destination Niagara USA is showing appreciation for all individuals working in the hospitality and tourism industry across Niagara County. This event is FREE to attendees and is simply an afternoon for all employees in the industry to get together, have fun, enjoy great food and have an opportunity to win prizes. You're Invited! Join us in celebrating the hospitality community for a Day of Appreciation on Tuesday, May 16 from 11:30 a.m. - 3 p.m at the Conference & Event Center Niagara Falls. Enjoy food, fun and prizes all afternoon! Free to attend.